1. You need to give them value. Something interesting to read, watch or listen to. Something that captures their attention. Something that answers their questions. Something just for them. Something new and fresh. 2. You need to give them what they are looking for. What are real estate visitors to your blog/site looking for? One of two things: Either they are looking for houses to buy or they are looking for help in selling their house. But as you know, it’s not just about drawing traffic (aka readers, aka prospects) to your blog/site. Just because they like what you have given them freely doesn’t mean they’ll choose you to help them with their next transaction. In reality, your blog/site is for one thing and one thing only: It is for getting people to give you their contact information. Without that, it means nothing. Without their contact information, all your efforts are in vain. You can have a gorgeous site with a ton of traffic. If you are not capturing that traffic, it’s a waste of your time. When you offer everything freely, the consumer believes it has no value. When you offer a gift in exchange for something from the consumer, that information is suddenly perceived as valuable. 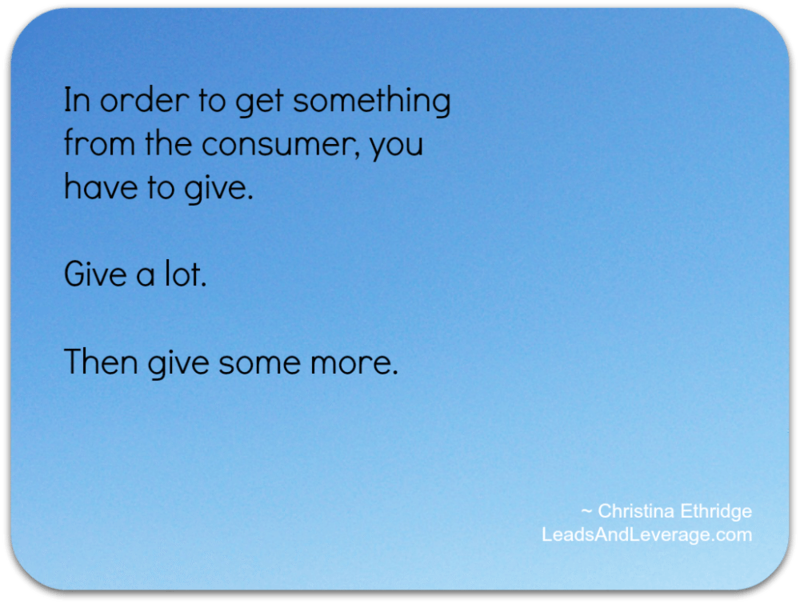 In order to get something from the consumer, you have to give. Give a lot. Then give some more. You don’t have to give freely — you just have to give. Give value. Give answers. Give commodities. Constantly giving is your goal. You need blog content. Fresh. As often as possible. Ideally a minimum of four times per week. Make sure you are focused on your niche and stay there. Don’t wander. You’ll confuse the prospect. You need to offer consumers something and ask consumers for something in every blog post you write. Offer them a resource, an answer, information, knowledge. Ask them for their email address. You need to offer IDX of your MLS on your blog/site — with forced registration. We found tremendous success with registration required to see details after a search was done. You need to require the consumer to sign in to access your IDX (require their name, phone number and email address). Yes, require their phone number. More than three-fourths will give you an accurate, working phone number. If you don’t require it, less than 5 percent will actually give it. You need to offer e-books and pamphlets to your consumers to help them sell their homes. What are they struggling with? What are their questions? When you know your niche, you know their thought process, their needs, their desires. Fulfill those needs and desires through your e-books and pamphlets. You need to require the consumer to sign in to access these free e-books and pamphlets. Always. You give, they give.